Can’t Say That for iPod Touch, iPhone, and iPad is a successful word game blending elements of Words with Friends, $100,000 Pyramid, and Draw Something. Fugazo, Inc. incorporates smooth, intuitive navigation and thoughtful social gaming features to create a fun, easy escape. You create an account by signing up with your email or your Facebook account. Currently, you must enter log-in credentials each time you open the Can’t Say That iPhone app, but the glitch should be resolved when Apple approves the next update. A quick authorization with your Facebook account does enhance functionality, so you can play with friends and seek help when you’re stuck. The efficient log-in process is accomplished within nice, clean, and engaging name tag graphics. The name tags lend themselves to the list format that is easily navigated and logical. The name tags are framed with bold orange and purple backgrounds and a top menu bar reminiscent of retro board games. To play the Can’t Say That iPhone app, you touch the start game button on the top menu bar or the option in the top name tag. You can play with Facebook friends, invite friends by sending an email, or a randomly chosen user from the Can’t Say That social community. You simply touch the screen on the appropriate icon. You are then transported to a screen similar to Draw with Friends. You select from three words, and the difficulty of the word increases the points available for successfully guessing the word. You have a chance to type in clues for the word chosen, and, with a nod to $100,000 Pyramid, you cannot include a word in the clue or the most obvious words. The space available is small, but certainly enough to offer a great clue. You press done, and you await your opponent’s move. When you are guessing a word, you can send the clue to Facebook for a friend’s assistance with a touch. If you have purchased the paid version, you can redeem one of the 500 included coins to get a hint. For the free version, you must earn coins or purchase them within the app. 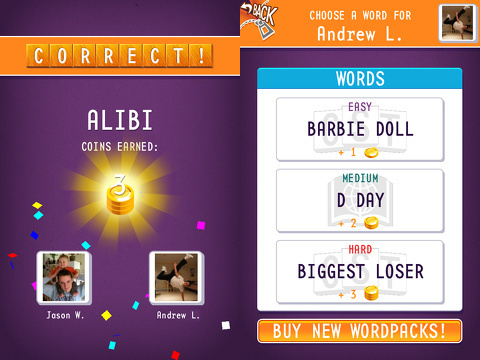 The great, streamlined game play interface increases the appeal of the Can’t Say That iPhone, iPod Touch, and iPad app. 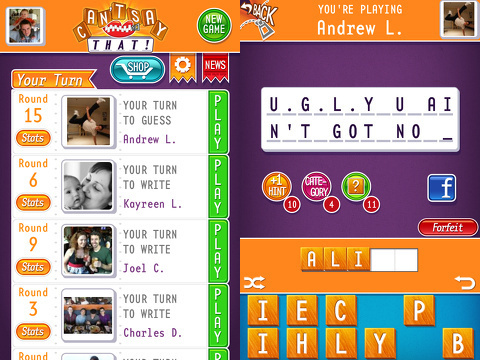 The graphics are cleaner than Draw Something, and the interface is much less cluttered and fussy than Words with Friends. The sharing features only include Facebook, so you don’t have as many icons and authorizations muddying the gaming experience. Can’t Say That for iPhone, iPod Touch, and iPad is a must-have for families, friends, and those of us who can’t draw. AppSafari review of Can’t Say That! was written by Jenni Ward on August 1st, 2012 and categorized under App Store, Featured, Games, iPad apps, Puzzler, Social, Universal, Word Games. Page viewed 5658 times, 1 so far today. Need help on using these apps? Please read the Help Page.